The Raymarine A57D Chartplotter/Fishfinder is a powerful advanced chartplotting navigation system combined with Raymarine's award winning HD digital Fishfinder.The display is a 5.7” high resolution color VGA that is viewable even in direct sunlight. The special waterproof construction make the A57D a perfect fit for open cockpits and center consoles. This A57D Chartplotter does not include any preloaded charts. However you can use any of the NAVIONICS charts, U.S. Costal, U.S. Inland Lake & Rivers or local charts in the rest of the world. 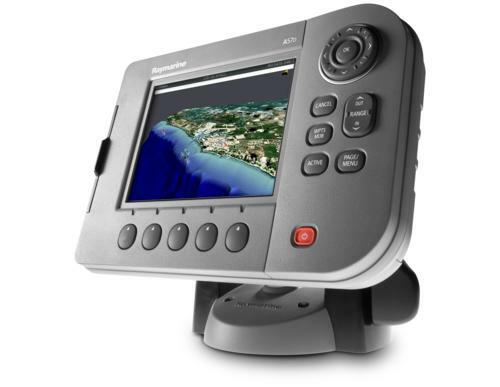 Using the built-in card reader you can simply plug any charts card like NAVIONICS Gold, NAVIONICS Platinum or HOTMAPS and upgrage your chartplotting to 3D bathymetric views, satellite photo maps, panoramic port photos, dynamic tides & currents, enhanced coastal points of interest and more! Each Raymarine A57D features a high sensitivity internal WAAS GPS receiver built into the display so no extra antenna or cables are required. Simply mount the unit on your dash or console and get excellent GPS pinpoint chartplotter accuracy. For situations where an external antenna is needed, you can add a RayStar 125 GPS antenna. Combine GPS and VHF technology for added situational awareness and safety. The A57D utilizes DSC position polling (with DSC equipped VHF) and AIS target tracking (with optional AIS250) right on your chart. Raymarine A57D Chartplotter has a built-in digital sounder module for Fishfinder features. With the amazing Raymarine’s HD Digital fishfinder technology, the A57D’s offers unmatched fishfinding clarity and precision. Raymarine’s patented HD Digital technology enables the A57D to instantly adapt to changing water and seabed conditions, delivering a dramatically clearer picture than ordinary analog fishfinders. The HD Digital technology enables true “hands-free” automatic operation, for an optimal fishfinder display at all times. Also enjoy full chartplotter integration, the A57D lets you mark wrecks and fish targets as waypoints. Easily switch screens back to the chartplotter and navigate right to your target! You just need to plug in to the included transom mount transducer and you have the ultimate digital fishfinder. Using the same patented HD Digital technology the A57D’s built-in sounder packs 500 watts RMS of power with a dual frequency (50/200 Khz) transceiver for excellent inshore and offshore performance. Directly compatible with the full array of A Series transducers, and adaptable to the DSM300 family of transducers, a wide selection of styles are available to fit almost any boat including transom mounts, thru-hull mounts and in-hull solutions. The A57D Chartplotter comes with a tilt and swivel bracket so you can easily change it's position for best viewing. Easily turn the lever to the other side and quick release the A57D to take it with you when you leave the boat. The built-in cable management system keeps your cables neat and tidy and also prevents water going down your console. Once the A57D is off the boat the the cables are safely left with protective cable caps. The Display can be also console mounted with a special included kit. You can add the SR50 weather receiver and get a full graphical marine weather forcast to your A57D. Using SIRIUS Satellite weather technology (US only) the A57D gets the most recent forecast information including weather radar, storm tracks, winds, lightning, temperatures of sea surface, surface pressure, wave heights and more. The A57D is also SIRIUS Satellite radio capable. By connecting the SR50 to your boat's stereo you will get over130 channels of satellite radio entertainment, commercial free music, sports, news and more. You have full control of channels and volume with the A57D keypads. No preloaded cartography. Use optional Navionics Gold or Platinum charts. SIRIUS Satellite radio capability. Set reminders for favourite songs and artists on over 100 SIRIUS radio channels. Target Symbols: Sleeping, activated, selected, dangerous and lost. Target Information: AIS vectors, safety critical data and full AIS data. Collision Avoidance: Safe zones and safety messages. Alarms: Local alarm messages, lost targets. AIS overlay: Switch AIS symbols on/off. Display heading/speed vectors and ROT. View detailed AIS data, safety critical target data, ALR and SRM messages. Set up a safe zone. Waypoints: 1200 Waypoints with 16 character names. Additional waypoint storage available on CompactFlash cards. Waypoints Transfer: Waypoints database via NMEA and CompactFlash cards. Presentation Modes: Head up, Course up or North up (selectable True or Magnetic). Relative, Autorange or True Motion. Screen offset. 3D synchronisation. 3D/Chart Synchronisation: To synchronise 3D and 2D chart scales and orientation. Bottom Coverage Display: Shows the diameter of the transducer beam where it meets the bottom. Bottom Lock: Displays echoes directly above the bottom. Data pages: 5 pages available. Pre-defined (Navigation, Waypoint, Route, Fishing or Sailing) or user-configured. Engine pages: 5 pages available. Pre-defined (engine, engine and fuel, fuel resources, engine and resources, twin engines or triple engine support) or user-configured. Raymarine A-Series Chartplotter - "Closer Look"
Click the button below to add the Raymarine A57D Chartplotter/Fishfinder 5.7'' Display no charts to your wish list.